Flappy Bird is astonishing tricky iOS and Android game, hooking millions of players. It has taken the app store on uproar from the players getting crazy about this exceptionally addictive game.The most surprise part is the developer Dong Nguyen removed the game from the iOS and Android app marketplaces and that left us with. On the contrary, you can grab the opportunity to re-build the clone application as most of the people love playing this game and earn $. MAADI (Mobile Application Development India) is all way along to help you for development of Flappy Bird clone and a good developer is the one who gets your app to the store at a rapid pace. Our mobile app developers get you similar app like a flappy bird that helps you to get to earn more dollars. We believe that building a clone helps you stand with the crowds in the clone app. What is the time span to required to build Whatsapp clone? Approximately two weeks and may be more or lesser. What will be the quirks of the game? How to generate revenue as a customer? In-app purchases, features unlock, showing ads. Moreover, you can also add the feature if they don't want to see the ad, they have to pay and most importantly, ad-integration generates the huge amount of revenue, you ever imagined. 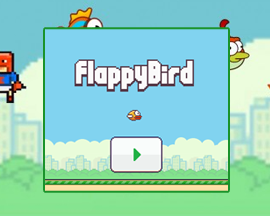 How to market the Flappy Bird Clone developed? Our team of developers are well-versed with marketing tools gaming with Chartboost, RevMob and more and get competent to help make you more money. How to believe about what you are saying? In this emerging world of internet, trust is the foremost thing. And we at MAADI are well-versed with a wide range of projects that is clearly being observed by our work done and you are always welcome to work with us and experience it yourself. Flappy Bird makes the users more addictive to accept challenges as they more to further levels. We are right by your side, if you need to add any more extra additional features to make the game more challenging very similar to Flappy Bird.